1. Stand straight with your feet wide and hold a dumbbell in each hand. 2. 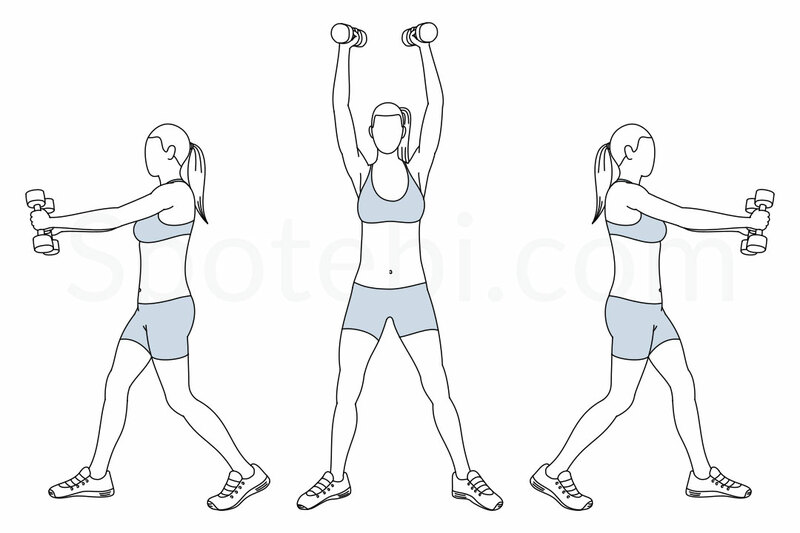 Rotate your body to the right and bring the dumbbells up to shoulder height, with your hands facing each other. 3. As you rotate your body to face front, bring the dumbbells up and over your head. 4. Lower the dumbbells as you rotate your body to the left. 5. Rotate your body again to face front, lift the dumbbells and repeat the exercise until the set is complete. Tighten your core, keep your feet and knees pointing in the same direction, and keep your back flat and in line with your neck and head. Exhale as you raise the dumbbells above your head and breathe in as you rotate to the sides and lower the dumbbells. The dumbbell overhead rainbow targets the shoulders and helps to improve muscle strength and range of motion. By rotating your body to the sides, you’re engaging your core and improving stability and balance. 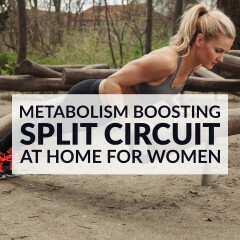 This exercise also helps to tone and sculpt the arms and increases upper body strength. 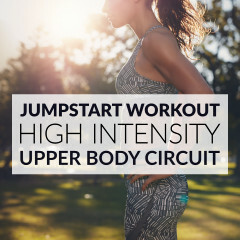 Do 3 sets of 12 to 16 repetitions and, for a complete upper body workout, pair this exercise with decline push ups, the bent over row press and the up and down plank.